Author | Editor: Bragg, B. & Pagano, S. (NSI, Inc). United States Central Command (CENTCOM) posed the following question to the Strategic Multi-layer Assessment (SMA) virtual reach back cell: What opportunities are there for USCENTCOM to shape a post-ISIL Iraq and regional security environment, promoting greater stability? Analyses of the security challenges facing post-ISIL Iraq frequently emphasize two central points. The first of these is that any security solution must address the political concerns and goals of key actors. This report is focused on providing insight into not only security factors, but also those political and social factors that have follow-on effects for the security domain. The second point is that both political interests and security interests are highly localized. We acknowledge the tremendous variation in interest groups within the social and political landscape in Iraq. At the same time, social science methodologies are oriented around making sense of such fragmentation, by looking for commonalities within and across societies. While no generalization will ever cover every possible case or variation, the common themes that are derived will represent likely scenarios. Toward this goal, we focus here on the broad ethno-sectarian divisions that are often currently in use in Iraq: Sunni, Shia, and Kurd. Where possible, we seek to specify relevant subgroups (e.g., Shia-led militia, Peshmerga, Sunni tribal elites). While we recognize that there is variation both within and even entirely outside of these groups, the discussion and insights here capture the interests and grievances of a wide segment of the Iraqi population as a whole. The provision of security is one of the fundamental functions of all governments, and as such, contributes directly to governing legitimacy. For a country such as Iraq, emerging from a period of conflict with unresolved and highly salient sectarian divisions, the relationship between security and governing legitimacy is even more critical for stability. If key stakeholders do not perceive the national government to be legitimate, they are unlikely to trust that that government will meet their security needs. A post-ISIL Iraq will face a complex security environment with multiple government and militia forces identifying with Shia, Kurdish, and Sunni populations as much as, and in some cases more than, with the Iraqi state. Given the recent history of sectarian competition and conflict surrounding Iraq’s security apparatus and national government, political reconciliation between Kurds, Shia, and Sunni, irrespective of the institutional form that takes, will be essential for creating short term stability (ending open conflict). Moreover, the achievement of a more general social accord is a necessary condition for the development of a cohesive national identity. Common national identity (not to be confused with nationalism) increases the legitimacy of national government, and as such, is an important foundation for longer-term political stability. This report presents insights from the analysis of a set of qualitative loop diagrams1 of the security dynamics for Kurds, Shia, and Sunni, constructed around social accord and governing legitimacy in Iraq. 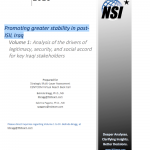 The relationships and feedback loops for each of the key stakeholders (Shia, Kurd, and Sunni) have been developed through the application of NSI’s StaM model.2 Our analysis for this report focuses specifically on the dynamics that drive the security and stability challenges facing Iraq post-ISIL. Our analysis indicates that, for each group, there is a key interest—both driving and driven by their relations with other groups—that is central to understanding how the security-legitimacy relationship manifests for that group. For the Sunni, it is their perception of equality (or lack thereof) and fear of retribution; for the Shia, their drive to maintain political dominance, and for the Kurds, their desire for greater autonomy. A qualitative loop diagram is a visual heuristic for grasping complex recursive relationships among factors, and is a useful means of uncovering unanticipated or non-intuitive interaction effects embedded in complex environments such as that we see in Iraq. It is intended to serve as a “thinking tool” for analysts, practitioners, and decision makers. 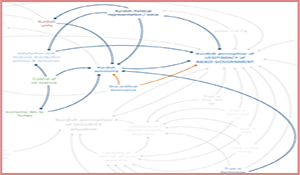 Once produced, the “map” of the direct and indirect relationships between legitimacy, social accord, and Iraqi perceptions of security, can be used to explore those relationships, test hypotheses about them, and provide a broad picture of second- and third-order effects on critical nodes in the system. For CENTCOM and others involved in building stability in Iraq, a clear understanding of the system that links Iraqi politics and social relations to security is a critical prerequisite for identifying areas in which CENTCOM activities might have the greatest positive impact and those where the risk of unintended consequences is highest. The report is organized in two volumes: Volume 1, here, presents the detailed insights of the loop diagram analyses, along with a discussion of key areas of opportunity or risk mitigation for CENTCOM, while Volume 2 provides a more in-depth and comprehensive discussion of the key social factors that significantly impact the political domain, and thus ultimately, stability in Iraq. Traditionally, the social scientific emphasis when examining issues of security has been heavily rooted in international relations and politics. In more recent years, additional layers of insight have been added from anthropology, sociology, and psychology. Here, we take a heavily social psychological approach to examining the social domain, though we continue to incorporate concepts from across the social science disciplinary spectrum. The utility of this work is enhanced by the loop diagram methodology—which emphasizes looking at cross-cutting effects both within and across the major domains of interest—and generates new insights about the reciprocal and balancing effects that exist among these social, political, and security domains. This enables a more transparent assessment of relationships both between and within specific groups. Before turning to the loop diagrams, however, a brief discussion of the concepts of social accord and legitimacy in the context of Iraq is warranted. This is followed by a discussion of important features and nodes excerpted from the complete loop diagrams for Kurds, Shia, and Sunni.3 The final section presents general findings across the various subgroups, and identifies risks and opportunities associated with CENTCOM and other US efforts to shape the security environment and promote stability in post-ISIL Iraq.